We travel with our dogs in the car a LOT. 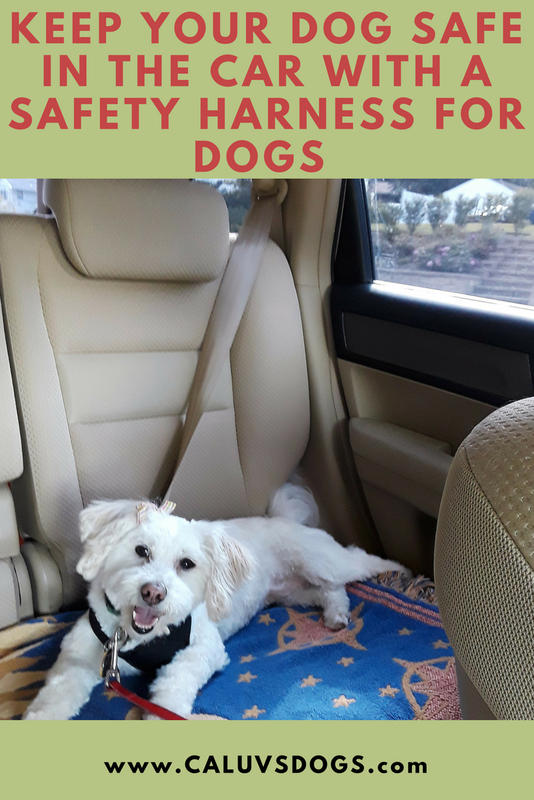 Whether it's short rides to dog friendly parks and beaches or a cross country road trip with the dogs, traveling safely with our dogs in the car is a priority. That's why I use a Dog Car Safety Harness that attaches to my car's seatbelt to keep my dogs secure in the car. I didn't always use a travel safety harness for my dogs, but I do now! Although my personal preference is a car safety harness for dogs, there are other ways to keep dogs safe in the car. Some of my friends like to use a crate in the car for their dogs. Others like to use a pet carrier for dogs while riding in the car. Whichever pet safety product you choose to use in the car, it will probably work very well as long as it keeps the dog secured. 🐶 Dogs should never ride in the front seat. If there's an accident, a dog or cat can be thrown through the windshield on impact. Dogs can also be injured by the impact of an inflating airbag, the one in front of them and possibly even an airbag to the side of the dog. It's also possible that a dog can potentially be smothered if a front seat airbag inflates, especially if the dog is small. Needless to say, pets should never ride on the driver's lap! That can be a big distraction to the driver, which by default creates a safety issue for the driver, their pet, and others on the road. As I stated above, the dog can be thrown through the windshield or smothered by an inflating airbag. I shudder to think what could happen to a dog on the driver's lap in the event of a head-on collision! Although many dogs love it, dogs should not hang their head out the window of a moving car. The dog's head could hit another vehicle beside them, or the side mirror of a vehicle next to them. They could hit their head on a low hanging tree branch, a bicycle rider, or any other object close to the car. Dirt and debris can fly into a dog's eyes and could cause injury to the eye. My eyes are far too preious, not to mention pretty, to get dirt in them by hanging my head out the window! Also, I don't want to get smacked in the head by a Mack truck. If the car window is open enough, a dog can jump out. If they become startled or see something irresistible on the street like a squirrel or cat, they just might jump out the window. Dog owners who think their dog would never, ever jump out the car window should think again. Shih Tzu Happens, I always say! Why take the chance of your dog jumping out of a moving car into traffic?! Perish the thought! 🐶 Never put a dog in an open truck flatbed! Please, please don't drive with your dog in an open truck bed! I saw this a lot when we lived in Phoenix and it made me cringe. I once saw a Siberian Husky puppy riding in an open truck bed with a little girl. The dog's leash appeared to be tied down inside the truck bed but it didn't look like the girl was secured at all. Even if the girl was secured somehow, that is still a massive NO-NO! It was all I could do not to scream at the driver through the window and deliver a swift lecture. The dangers of a dog in an open truck bed should be obvious. Even if he's tied down, what will happen to the dog in the event of an accident?! What if the dog tried to jump out of the truck? He could very well be pulled under the tires or be dragged along by his leash and strangled. Dogs should ride safely in the back seat or the rear of the vehicle, and they should be secured either by a dog safety harness, a dog crate, or a pet carrier, with the carrier being secured to the seatbelt and the crate being secured in the rear of the car. 🚗 How does a dog Car Safety Harness work? A dog travel harness is easy to use. It goes on the dog just like any other harness but it has an additional loop you can put a seat belt strap through and buckle it to the car's seat belt. This short video (2 mins) demonstrates how to use a dog car seat belt harness to keep dogs safe in the car. I'm using a dog travel safety harness from Four Paws, which I got on Chewy.com but there are many others out there. A car safety belt harness for dogs usually works with any car seat belt system. Attaching a dog safety harness to a seat belt in the car is similar to securing a child safety seat to the car's seat belt. If you get out of your car, an unsecured dog may panic and jump out! If you are involved in a car accident, even a minor one, your dog can panic and try to get out of the car when a door is opened. I'm not about scare tactics, but I think it's important to know the risks of not securing your pet in the car. If you make a purchase using this link I may receive a few pennies in return at no extra cost to you. If you do I'm grateful, as sales made through my links can help keep my blog going! I'll end this post with two disturbing stories. Not long ago I read about a woman driving with her German Shepherd when they had a minor accident with another car. When she got out of the car to exchange insurance information with the other driver she didn't close her door fast enough. Her dog, who was in the back seat, panicked and jumped out of the car into traffic. He was struck by another car and killed. The tragic loss of her beautiful dog could have been prevented if the dog was secured in the back seat. I remember this 2003 story all too well. A family was traveling on vacation with their beloved Pit Bull mix dog, Patton. Due to poor communication and a case of mistaken identity, the family was pulled over by police and forced out of the car. Their sweet, friendly dog wasn't secured in the car and jumped out. One of the Officers felt "threatened" because of the dog's assumed Pit Bull breed. He shot and killed their beloved dog. This story haunts me so much. Every time I think about this family's tragic loss, it makes me sick to my stomach. Would a nervous police officer feel threatened by Icy, my Siberian Husky? Perhaps. You can read more about the heartbreaking story of this family's loss in my post Fight Breed Discrimination, Not Dogs. All these potential dangers have made me a convert. I no longer put my dogs in the car without securing them in the back seat. A few extra minutes is well worth it, their lives are far too precious to take chances with their safety. 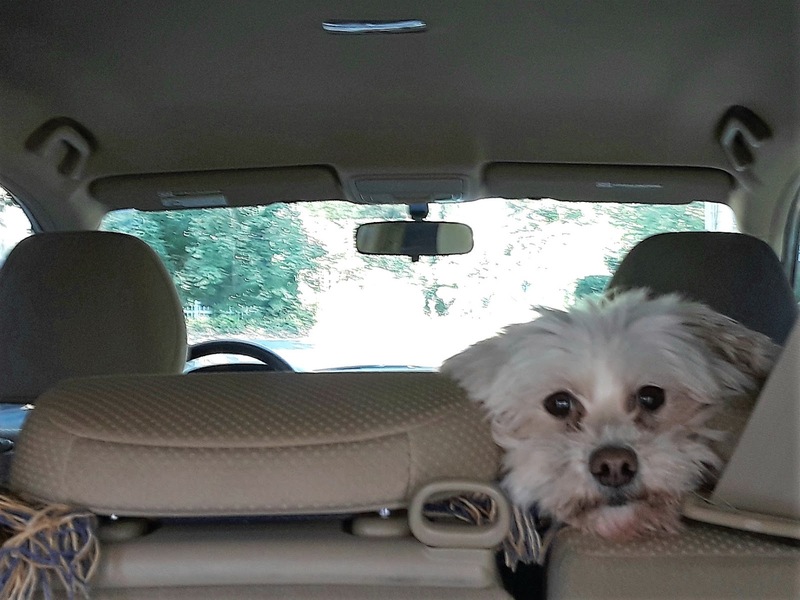 Once your pup is safe in the car take a fun road trip with your dog to one of these fabulous dog friendly destinations! How do you keep your pet safe while riding in the car? Leave us a comment and share your car safety tips for pets! We put the corgis in crates in the car. Back when I had larger dogs, I sure could have used harnesses like what you use. I think Crates are good too as long as they're in there secure. I like the harness because it's comfortable, the dogs can move a little with it & it doubles as a walking harness so it's easy. Thanks! I'm glad you think so. I know, it drives me crazy when I see dogs crawling all over the car or riding in a driver's lap. They may regret it badly one day. I didn't do all the right things either. But now the cats ride in secured carriers or in their sturdi tent. I take them out of the sturdi and put them in their carrier with the doors to the car closed. Good for you Holly! Carriers, Crates, & travel safety harnesses are all good and will help keep pets safer in the car. Our dog goes in the car with us maybe once every couple of months. To the vet of course and occasionally to visit the in laws. He hates riding in the car, but we should really look into a harness! Great instructional video, too. Thanks, I'm so glad you think the video was helpful! He may actually feel more secure if he's in a carrier or harness in the car. Give it a try. Mr. N rides in a car seat. I heard someone telling a story the other day about their dog falling off their truck bed onto the highway and was horrified. He was injured but survived thankfully. Gasp!!! Oh how awful, they are so lucky their dog survived that. I hope they learned a good lesson, that is the most dangerous place to have your dog! Thanks for sharing that story, it may help others. I hate seeing dogs riding in cars with their heads out the window. And putting them in the open bed of a truck is a disaster waiting to happen. Oh me too!! I cringe every time, secretly praying they don't get injured. An open truck bed is the worst place for a dog - it's just so dangerous! Has this harness been tested for efficacy and safety? It seems not all these products are. There aren't any formal safety guidelines for dog travel harnesses from what I understand. I heard about just a few of them being tested by a small non-profit organization, but I didn't recognize more than 1 or 2 of the brands tested. Dog products like these don't have recognized standards or guidelines the way child safety products do. I'm not sure if this one has been tested by any organization. I won it in a BlogPaws contest and I like it much better than the old harness I used for the dogs - that one was heavy, bulky, & the dogs hated it. Great information here Cathy! I had not considered minor accidents as potentially threatening to my dogs, but you're right. If I get out of the car, they could be panicked and run out too. We use the Sleepypod Harness whenever we take car rides. I've also been using the "Wait" cue a lot more for both dogs, but also to establish order on who gets out first. Thank you Irene! That is what scares me most, my dogs panicking and running out of the car into traffic. We use the Wait command ALL the time, it's a lifesaver. Sleepypod makes a great product from what I can see, that's a good choice. I have a harness for my dogs, but I don't think it is one of the safest harnesses on the market. I also need to get a booster seat for Nelly as she is very small. I think any safety harness is better than none - keeping your dog safely secured in the car so they don't panic and jump out or get thrown through the windshield in the even of an accident. A booster seat for a very small dog is a great idea. The boys ride in their car kennel. It keeps them safe and they can snuggle down for a nap on longer trips. That's a great idea. Anything that keeps them secured and safer in the car is so helpful. We have a lot of farming and lazy types here who put their dogs on the flatbed of trucks. I think its madness. Dogs need to be kept safe and this harness looks an absolute blessing. It is worse than madness, it's extremely dangerous! Dogs in an open truck bed can be a disaster - even if there's no accident they can still be severely injured or killed if they hit a bump or try to jump out. Great post, Cathy! When any of our Huskies travel with us, they either are in their crates in the back of the Jeep or in the back seat with a harness and doggie seat belt. We are huge advocates of safe driving with pets. Also pinning this to share on my "Bark About" board! Thanks for pinning my post Dorothy, I really appreciate that! I'm glad your Huskies stay safe in the vehicle, it's so important. I never thought about securing dogs in vehicles until reading a lot of posts from our dog blogging friends. Do you always wait until you get in the care before putting the harness on? I have tried both ways, putting it on before getting in the car and waiting until they're in the car to put it on. Icy has trouble jumping into the car with hers on but Phoebe seems to be more mobile with it on. Great post, I will share this with my niece. She takes her dog with her a lot and I don't think she harnesses her in. Thanks, I'm glad you enjoyed the post! I hope your niece will get a travel safety harness to keep her dog safe in the car - so many things can go wrong, even on a short ride! Great post, car safety is so important. I always had Red travel in her Sherpa bag and yes, Jack would stay on my husband's lap while I drove. Then one day we were pulled over while driving in Spain, and apparently dogs must be secured in a car. So after that warning and a fine we bought a seat belt which we attach to his harness. I see plenty of people who let their dogs hang out the window and it makes me nervous. A truck or a van gets too close and it's game over. Thanks for educating about the importance of car safety...for everyone. Wow, I'm actually glad to hear you got stopped in Spain for having sweet little Red on your husband's lap. Kudos for them for having that rule, and who knows it might have saved you from a future car travel catastrophe! Thanks for sharing your story, Hindy! Great Article. Pet safety is very important when we travel with pet. These tips really useful and valuable information which should keep in mind when we travel in the car with our beloved pet.